FREE Valentine's Scissor Preschool Practice! Super FUN! FREE Valentine’s Scissor Preschool Practice! This year the Princess is super excited about doing school with her older brothers. The princess is learning her sounds and numbers this year. However, she absolutely loves to cut. So I decided to make some FUN printables for her to practice cutting during our quiet time. Scissors are a must along with MUST have homeshcool products. She cuts out the pieces and pastes them onto construction paper kinda like a puzzle. 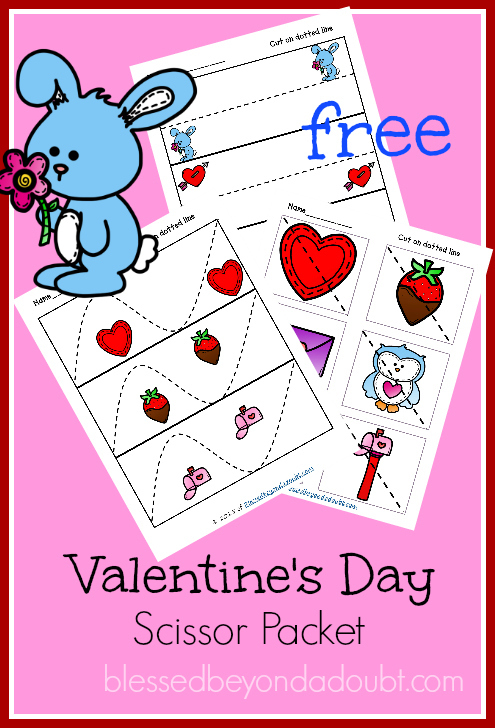 These cute FREE Valentine’s Scissor Preschool Pages are available to my email subscribers. Just fill out the form below and you will instantly receive these printables via email. Please check your spam folder. Hope your children enjoy these Valentine’s scissor preschool practice printables. Hi Jill, Thanks very much for the Valentine printable.